BSports, the world’s leaders in sports analytic technology and the newest member of the STATS global network, and Topps formally became business partners in order to manufacture custom-designed advanced analytics on selected trading cards in 2014. The unique statistical analysis will revolutionize the Industry for kids and adults by replacing traditional stats on the back of MLS and Bowman Chrome Baseball Cards this season. 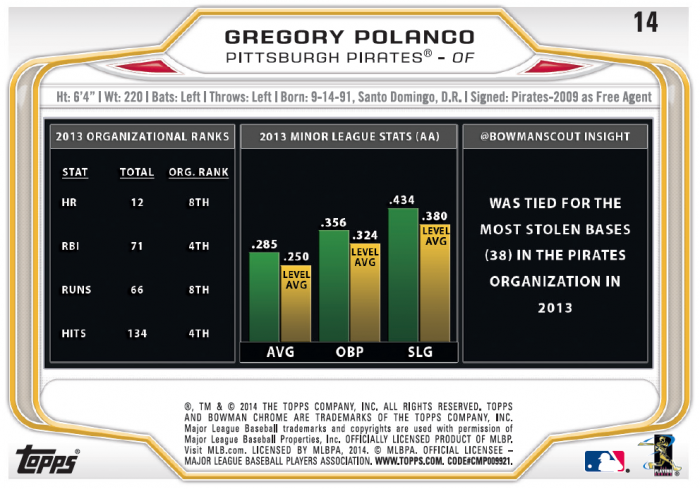 Bowman Chrome MLB card sets were recently released featuring six varieties of analytical templates compiled by Bloomberg Sports, with spray charts that help to visualize veteran power hitters’ home run locations and strikeout pitchers’ pitch selections. 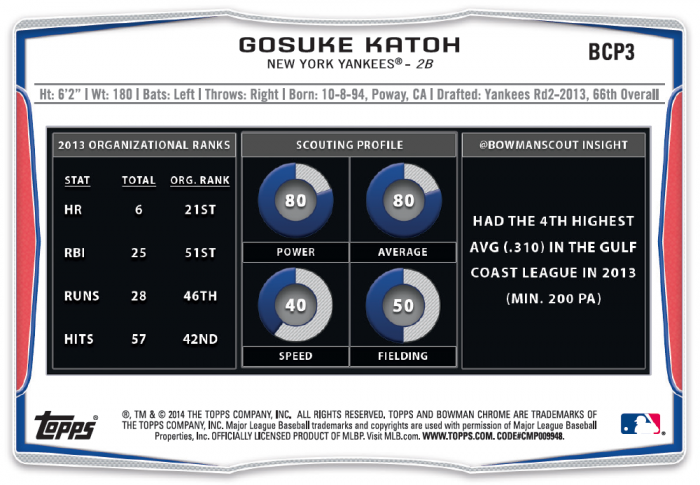 For MLB® prospects, statistics will include organizational rankings and comparisons to minor league averages. Superstars included in 2014 Bowman Chrome packs are MLB® rookies Jose Abreu, George Springer and Masahiro Tanaka, veterans Mike Trout, Yu Darvish and Bryce Harper, and prospects Byron Buxton and Kris Bryant. The card set also features autographed cards and an assortment of colorful parallel cards that are also collector items. The new 2014 Bowman Chrome Baseball set can be found in hobby stores this week. Topps® MLS Soccer, which also included unique analytics from Bloomberg Sports, are currently available at retail outlets. Launched in 2010, Bloomberg Sports takes the technology developed by Bloomberg, the leading global provider in data and analytics, and applies it to the vast data analysis opportunities in sports. Bloomberg Sports’ professional products for teams, broadcasters and athletes include a comprehensive baseball scouting, data and video system now used by almost all Major League Baseball clubs. The company also has introduced a consumer soccer product for European football, “Match Analysis,” a powerful predictive and analytic tool forecasting game results, as well as “Stats Insights,” a comprehensive blog that contains original content and analysis for the five major European football leagues as well as the NFL, NHL, MLB, and NBA. Bloomberg Sports has been named by SportPro Magazine as one of “Fifty Brands Shaping Global Sport in 2014,” by Mashable as one of its “Five Most Innovative Sports Brands for 2012,” by The Sports Business Journal as a Finalist for “Best In Sports Technology” in 2012 and by Fast Company Magazine as one of the “Most Innovative Companies in Sports” in 2011. For more information, please go to BSports.com. 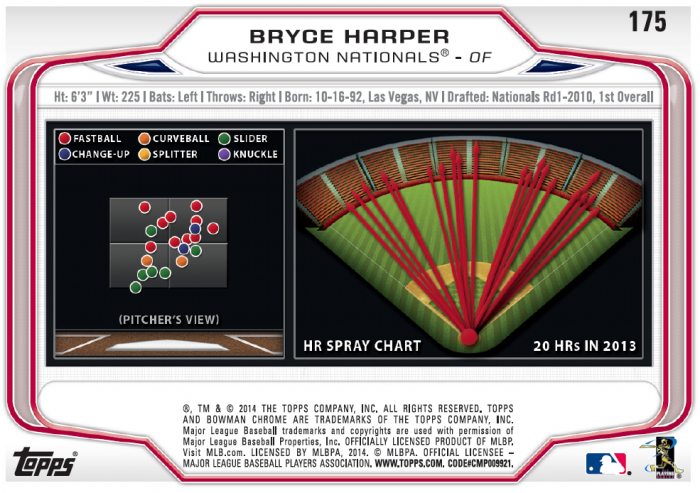 Sports Techie, The baseball and soccer trading card collectors in North America and around the world just upgraded their collections via the inclusion of sports tech-centric analytics created by Topps and BSports. Sports Technology such as those produced by BSports and STATS, have been a major component of the sportsbiz driving force behind professional sports leagues attempt to connect with fans in ways they want. Topps has been a proactive force with trading cards for generations so they naturally understand the need to integrate advanced analytics derived from sports tech solutions, systems and products, into their offerings. MLB playoffs are next month so the pennant and wildcard races are on full force, so there is not better way to get into the chase than with a set of Bowman Chrome Baseball cards to enhance your child’s, family member or adult friends, love of the sport, teams and players. 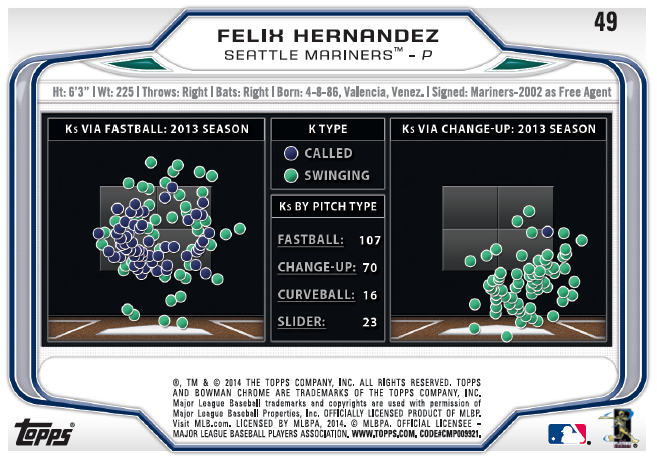 No doubt the new trading card for Seattle Mariners star pitcher, Felix Hernández, is going to be super popular as the potential American League Cy Young award winner helps his organization’s push for a postseason and World Series birth as they sit two games back in the current playoff race. The MLS power rankings, week 28 has the L.A. Galaxy and Seattle Sounders battling for the league’s top spot. Be sure to grab a set of MLS trading cards packed with key stats and advanced analytics from Topps and BSports as the season winds down to satisfy your collecting needs. It is an exiting era for trading card development. Our 15-month old son will be an Ultra Sports Techie by the time he is a teenager after he collects and analyzes the metrics and numbers of the next International Babe Ruth and Pele superstars on the back of his Topps and BSports, insightful trading cards.